Despite recent downtime, furry community site Fur Affinity grew significantly in 2009, according to figures released by The Dragoneer this month. Over 120,000 users joined the site; almost double that were active during the year, making over a million submissions. Users also made over 400,000 posts on their personal journals, garnering 3.5 million comments. Fur Affinity's success has come at a cost for other sites, who have found traffic stagnating. The VCL in particular has lost ground, while Yiffstar recently relaunched itself as SoFurry in an attempt to attract new users. Fur Affinity also plans to move to a new layout. For a site as large as FA, reported annual operating costs are relatively small at $14,231.76; donations and advertisements raised $13,943.79. I'm surprised at how fast VCL is tanking, though I can see why it has: With hard drive space decreasing in cost, there's no need anymore to pour over images for the tiniest 254 white pixel to achieve maximum file compression, and artist are seeking less picky websites in droves. The last time I checked their number of images had actually gone down, because people had left. I'm sure they still get plenty of visitors, but if they want new users and new pieces they need to get with the times and add features that encourage participation (comments might be a start). Or else fade, as Yerf did before its fall. The Alexa graph shows a downward trend, and the figures posted by Dragoneer are just a snapshot of 2009 activity, no comparison to the previous year. How can this be characterized as "growth"? The site passed 500,000 submissions on 15-16 April 2007, about two years in. They passed the 2,500,000th submission on 10 July 2009, just over two years later. The most recent submission number is 3,286,619. 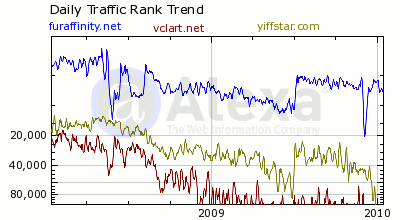 As can be seen from the sudden jumps in data, Alexa is - alas - not a perfect tool for site measurement, but both compete.com and quantcast (compare with vclart.net, yiffstar.com) suggest the VCL is losing traffic and FA is gaining it, though they offer differing assessments of Yiffstar/SoFurry. Um.. it would show a decrease, except that the numbers in that chart get larger going down, not up. Maybe its an error, or a bigger number is worse? The chart is confusing. A bigger number on the graph is "worse" as it indicates a lower traffic rank (as compared to all sites in the world). I would like to see a real list of users from FA. While one can say their user base has grown, proof of this is still hard to look at. ..and well I could go on (I have made quite a few myself), but I'm sure you get the point. If they can put all of these "New Users" in a section called "Communities" or "Comics", and with a Total Number, that would be helpful. Some of those are "groups" or "communities". One of the features that has been requested is proper support for such accounts in a manner similar to communities on LiveJournal, but unless and until such support is added they are handled in the same manner as individual accounts. Of course there have also been joke/bogus accounts registered, such as the first three listed here, not to mention overt troll/vandal accounts and attempts to impersonate well-known artists who hadn't registered their own account.